Select the group from the left panel. Click Delete from the command bar. 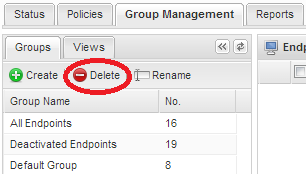 If endpoints are assigned to this group, another dialog asks you to select a group where you want the endpoints moved. Select the target group, then click Save.